Common approaches to replacing missing teeth are dental implants, fixed partial dentures, or removable partial dentures. We are excited to share some great news with you about our practice. We recently purchased a 3D, Carestream 8100 Cone Beam CT scanner! This technology is designed to give every patient the best result possible. If you have any questions, please do not hesitate to call. This is an excellent article from the New York Times on the differences between implants and bridges. Announcing "Love the Gums You're With"
Did you know that one in every two adults ages 30 and older suffer from periodontal disease (commonly referred to as gum disease)? That statistic is staggering, considering it can be prevented in many cases. 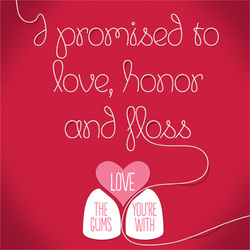 To tackle the issue, the American Academy of Periodontology (AAP) and its 8,300 members are launching a new campaign for all Americans to "Love the Gums You're With". Furthermore, patients can take a brief quiz on perio.org to evaluate the current state of their gum health, learn the signs and symptoms of periodontal disease, and receive tips on how to properly care for their gums. Schedule an appointment with a periodontist, a specialist in the prevention, diagnosis and treatment of periodontal disease, for a comprehensive periodontal evaluation and specialized periodontal treatment plan to help support a life-long commitment to healthy gums. The Guinness Book of World Records currently lists the World's Largest Toothbrush Collection as containing 1,320 different brushes. While that is an impressive amount, the key to maintaining gum health is not how many toothbrushes you own, but rather how effectively you brush your teeth! To brush effectively, below are six tips we recommend to our patients. 1) Toothbrush selection: Always use a soft bristle toothbrush. Hard bristles are very abrasive to the tooth enamel, while soft bristles gently clean plaque from the teeth and keep the enamel intact. Hard bristles are also irritating to the gums and may push them away from the teeth. Learn More: Delta Dental has posted a good article about "How to select a toothbrush"
2) When should you brush your teeth? : The goal is to remove the debris and plaque from the teeth. After eating food or drinking non-water liquids, it is important to brush your teeth as soon as possible. If you ingest acidic food/drinks or have acid reflux, wait 30 minutes before brushing. 3) Toothbrush angle: Tilt the toothbrush 45 degrees to the tooth and place the bristles on the gumline. Gently brush the outside and inside surface of each tooth using back and forth strokes. 4) Toothbrush motion: Do not scrape across multiple teeth. Focus on an individual tooth area and apply the toothbrush using back and forth strokes at the gumline (described above). Then, lift the toothbrush and move it to the next tooth area. Apply and repeat until all tooth surfaces are brushed. 5) How long should you brush? : Spend at least 120 seconds brushing. Keep a clock in the bathroom or use an electric toothbrush with a timer. Focus on cleaning each tooth for a few seconds. When you are finished, brush your tongue! 6) How often should you replace your toothbrush? : You should replace your toothbrush when it begins to show wear, or every three months, whichever comes first. It is also very important to change toothbrushes after you've had a cold, since the bristles can collect germs that can lead to reinfection. Feel free to post a comment if you have an additional tip about toothbrushing you'd like to share. Smile!